Product prices and availability are accurate as of 2019-04-05 07:49:17 EDT and are subject to change. Any price and availability information displayed on http://www.amazon.com/ at the time of purchase will apply to the purchase of this product. Get Accurate, Reliable Measurements and Do Your Work with Safety and Ease with the #1 Digital Clamp Multimeter by TechExpert! Are you looking for a high quality clamp multimeter that guarantees excellent performance, every single time? Do you need a 100% safe multimeter with efficient jaws that will make your life easier, even in the most uncomfortable places? Then this digital clamp multimeter is the right one for you! 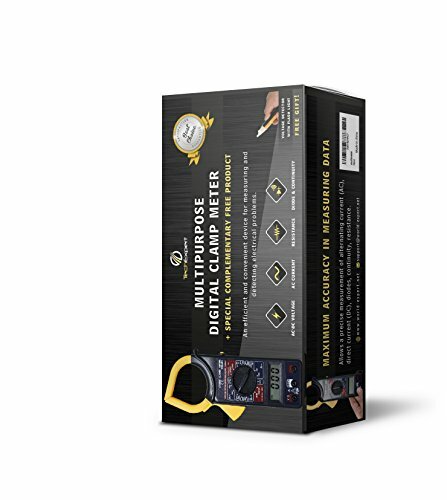 Highly portable and convenient, digital clamp multimeter is designed for electricians, technicians, servicemen or hobbyists, who are in need of a reliable and highly accurate instrument that is always ready for use. With a comfortable design and rugged construction, TechExpert clamp multimeter combines superior durability and comfort for convenient use, every time. Resistance: 100 m? - 20? ? Insulation Test (with option of 500V insulation tester unit): 100K ? - 2000?? Backed by a 100% risk-free money back guarantee of complete satisfaction, you have nothing to lose! Order Yours Today and Enjoy Working Like a Pro! 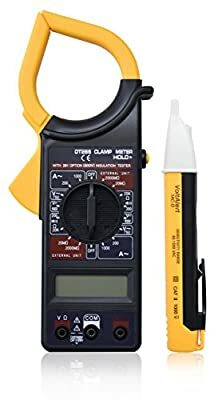 • WORK WITH THE BEST: Whether for verifying circuit integrity and operation, measuring ac/dc voltage, ac current, resistance or diode and continuity of switches, fuses and contacts, this digital clamp multimeter has all the measurement functions you need to get the job done. 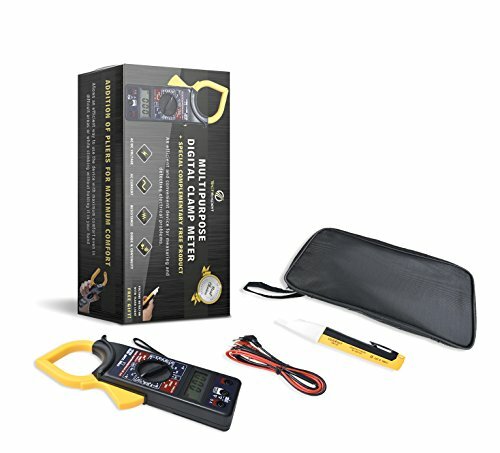 An indispensable tool for professional electricians, automation specialists, process/utility technicians or any interested hobbyist, this reliable meter boasts a slim and lightweight design for convenient operation. 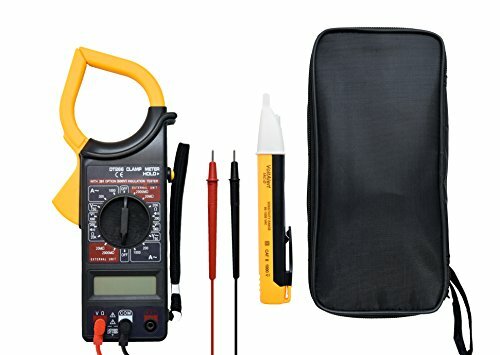 • TAKE YOUR MULTIMETER ON THE GO: Neatly packaged in a black, comfortable carrying case (included) for safe storage and easy transport anywhere, this kit comes complete with the DT266 digital clamp multimeter unit, your FREE, non-contact voltage detector pen, test leads and an instruction manual, so you can get to work right away! 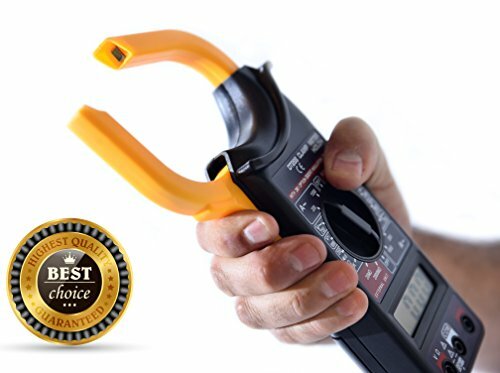 • TROUBLESHOOT AC/DC SYSTEMS SAFELY: Boasting sturdy jaws (2" opening) with an easy clamp control to allow for safe current measurements on live conductors, without circuit interruption, this multimeter easily clamps around bus bars or conductors in service panels/PLC cabinets for hassle-free access to tight wiring. Perfect for hands-free work at heights or while climbing, its rugged construction promises to survive accidental drops from ladders and give accurate results for years to come. • MULTIPURPOSE: Featuring a clearly readable LCD screen with 3 ½ digit display, a data hold/lock button for easy change of functions at a single push of the button, a durable rotary switch, as well as EXT/COM/V ? input connectors, this clamp meter offers an optional, insulation test function by accepting a 500V insulation tester unit. Operating features: AC Current: 0.1A-1000A, AC Voltage: 1V-750V, DC Voltage: 1V-1000V, Resistance: 100 m?-20? ?, Continuity Test: 50 ± 25 ? with buzzer sound. 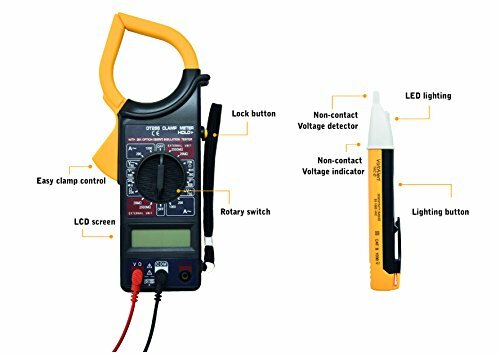 • FREE BONUS GIFT: Included in the box, you will also get your VoltAlert, a handy, non-contact 1AC-D voltage detector pen, completely FREE! With a sensitivity range of 90-1000 VAC and CAT II safety rating, this pocket size instrument is the safest way to make sure the power is off, without touching any wires or risking fatal accidents. Simply bring the tip of the pen in contact with a conductor or plug and the detector will immediately light up and make a buzzing noise to indicate a live wire.